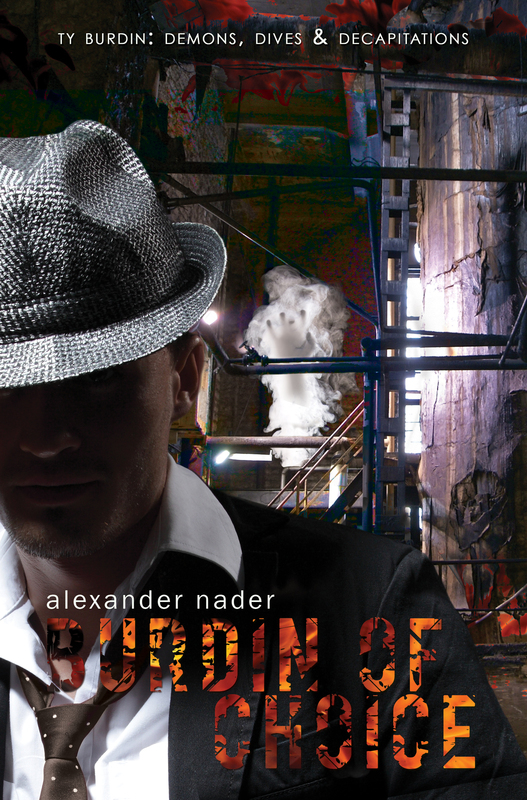 Today I’m happy to be hosting my friend, and fellow author, Alex Nader, whose sequel to Beasts of Burdin, Burdin of Choice has launched. Ty Burdin is back. Back to drinking and back to avoiding demons. He is, of course, the leading expert in his field. In both subjects. That’s probably why, when a customer offers him way too much money just to locate a missing car and some mysterious cargo, he readily agrees. The dude is human after all—Ty’s prime target client base. Along with the money comes a slew of disappearances which Ty tries to ignore while tracking down that car, because, of course, those missing people might be demon related, and as he’s said before, that’s agency business. Not his. Period. Ty Burdin is to back drinking as well as everything he vowed never to get involved with again. Question is, which one will kill him first? The booze, the demons, or the Agency? Once again Ty Burdin has me wrapped up and unable to close the book on his badass, smart witted, completely endearing nature. There is something so basic and pure about the way Alexander Nader breathes life into this character that it almost takes me back a step, and make me pause while I’m reading, just to take in what Ty has said. The simple, yet eloquent, while being utterly sarcastic, and also funny, way Nader portrays Ty is a skill I have yet to see done in the way Nader does it and makes this story hard to put down. At the end of Beasts of Burdin, book #1 in the trilogy, I wasn’t sure where the second installment in the series would go, or how it would get there, but Burdin of Choice picks up at a run, and keeps running. The book has meat. It has emotion. It has heart. Ty is someone you want to know. Well done. Can’t wait for book 3. LM: Burdin of Choice continues Ty Burdin’s story, and is the second book in the Beasts of Burdin Trilogy, how hard was it for you to get back into character, or did you go straight from Beasts of Burdin into Burdin of Choice? AN: I had originally planned for Beasts of Burdin to be a standalone novel. So when J. Taylor Publishing asked if I would write it as a trilogy, I kind of freaked out. I was super nervous (I had never written a sequel at the time) so I jumped right in to Burdin of Choice (BOC). Getting back in to character wasn’t as big a deal, but writing the story was. I think a lot of sequels just tell the original story over again to build on the success and I didn’t want that for Burdin. I took BOC in a new direction and that was scary for me. LM: Well, I really liked Beasts of Burdin and I loved Burdin of Choice even more, so I’m glad they pushed you to write a trilogy. 🙂 Ty, the MC in the story, (who is awesome) has quite a few issues bewteen fighting demons in the real world as well as in his own head, and that carries into the second book. One of my favorite scenes introduces new demons into the mix, as well as new characters. Do you plan which twists and turns each story will make before hand, or do you let the story and the characters lead you? AN: A little bit of both. I start with a rough outline. I’m talking rough. I mean like ‘getting fired on your first day of work’ rough. So I start with a plan, but there’s lots of room for adjustments as the story sees fit. I pretty much just plan on spending 170 pages ruining Ty’s life. I’m kind of a jerk like that. LM: It’s kind of our jobs to be jerks to our characters. 😉 Speaking of jerks, Ty might be considered as being a jerk sometimes, but he also has a sweet and endearing side, any inspirations behind the creation of his character? AN: Ty has a bit out a mouth on him. It may, or may not, get him in to trouble at times. :) Ty started from your average noir character. There’s something about the honesty in those old novels and movies that strikes me. The characters all say how they feel and it’s funny and honest and a little hurtful all at the same time. Ty was born from that. LM: Any particular music you listen to when you write? Something that inspires your stories? Or do you write in silence? AN: If I’m writing a really intricate scene, I usually write in silence. In general, I listen to instrumental stuff while I write too. Then again, here recently I’ve been listening to a lot of metal while I write. It really just depends. I have a hard time listening to music I know while I write because I think the lyrics instead of my words. LM: I almost always listen to music while I write, but sometimes I realize I’m singing … so I have to change the song. 😉 Anything special things you need nearby when you write? Favorite pen? Coffee? AN: A comfy chair, usually. I like to keep the wife close too. I make her listen to all the lines I’m proud of as I go along. To celebrate the launch Alex is having a Giveaway! AND as another way to celebrate the launch, Beasts of Burdin, book #1, is on sale now for .99! Alex lives in the tourist infested hills of east Tennessee with his amazing wife/muse and three superb children. He would tell you more about how awesome they are, but you probably wouldn’t believe him. When he’s not hanging out with them he’s making pizzas and occasionally he jots a few words down. He’s a big fan of good music, good storytelling, and fun, lots of fun. This entry was posted on November 13, 2014 by Laney. It was filed under Books, J Taylor Publishing, New Releases and was tagged with Alexander Nader, Amazon, Author, Beasts of Burdin trilogy, Burdin of Choice, Goodreads, J. Taylor Publishing.